Everywhere you look, people are writing about stock market crashes. If you do a lookup, you'll see a ton of articles and predictions and fodder about it all. One famous financial media entertainer even announced that the stock market is oversold and it's time to buy tomorrow! Anyway, for your information here's a quick refresher on what the difference between a stock market crash and a stock market correction. 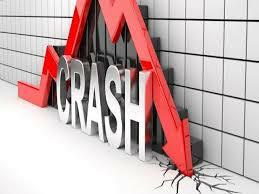 A stock market crash is when a stock index drops severely in a day or two of trading. The indexes are the Dow Jones Industrial Average, the S&P 500, and the NASDAQ. A crash is more sudden than a stock market correction. That's when the market falls 10 percent from its 52-week high over days, weeks, or even months. Such a pullback allows the market to consolidate before going toward higher highs. Remember do not panic. The market goes up AND down. Keep Track Of Your Net Worth: Hopefully you now know a little bit more about stock market corrections. Now the easiest way to grow your wealth is to know where all your money is going. Sign up for Personal Capital, the best free financial tool on the web. I use them and have seen my income and net worth blast off. They keep me motivated to budget, spend and invest wisely.